NEW COMMANDER "Not Ssy, Break Through!" It would be very nice to see such a commander in the game. A lot of hard work, a lot of thoughts. What do you think of it? 13CP = "IS-2 Heavy Tank". Would like to see this commander in a game? Please. Write komendariya that it wasn't pleasant to you that isn't enough, etc. A lot of conscript ideas that just make it more like Penals. Plus abilities that try to be both defensive and offensive at the same time. maybe is2 is 13 cp? I think "mark vehicleIs"Is better than "Stranthened Conscript"
Can be then "Commissar Squad" Is better than "Stranthened Conscript"
I can make other option? 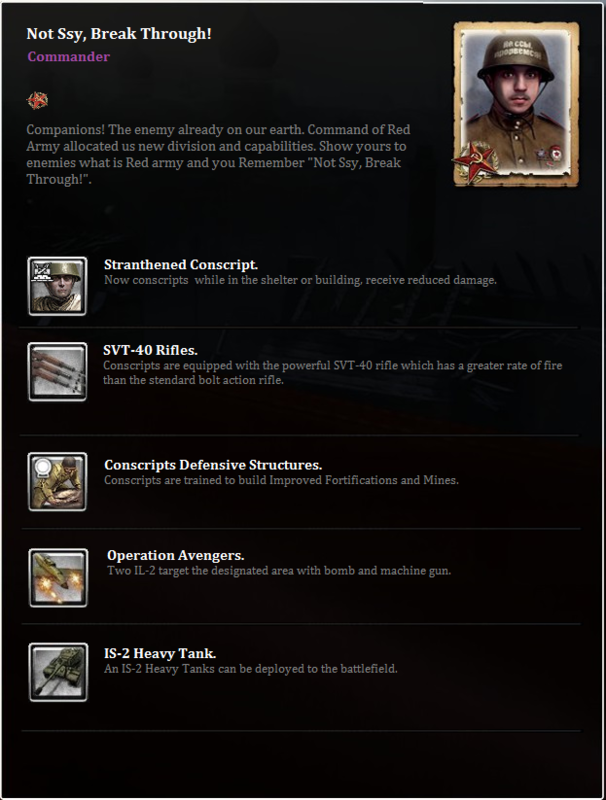 13CP = "IS-2 Heavy Tank"
Are already available for others commanders. Wehrmacht = Artillery Field Officer, Command Tanks. OKW = Sturm Offizier, Panther PzKpfw V Command Tank. British = Desigate Command Vehicle. The USSR = what don't have. "Let's add Kommissar Squad?" We shouldn't add things just because other factions have them. In the game Commissar Squad had various functions depending on the mission or Theatre of War scenario.